IT'S BEEN A GLORIOUS EVENING! Sunny and warm, with deep blue skies. Well that's the main piece of news at the moment. But it may not last - clouds are predicted for the northern half of the UK, the borderline is somewhere around Manchester. The current EWM temperature is 58/14 degrees. 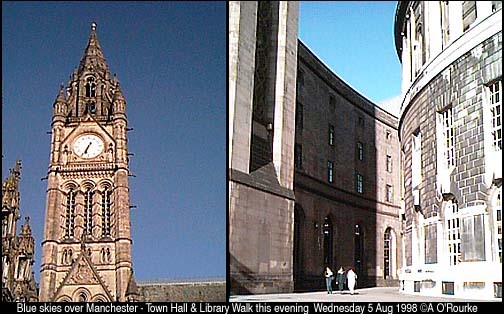 Tom Bloxham is a pioneer of urban renewal in Manchester and Liverpool. 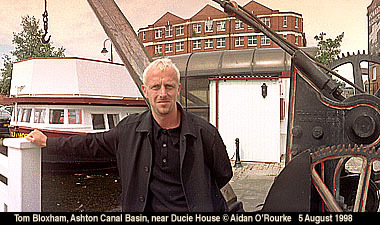 His company Urban Splash is one of the most successful in the country, and has won many awards. He first showed his entrepreneurial flair at university, when he supplemented his grant by selling records, then posters. Soon, he was changing the face of Manchester and Liverpool by buying up and renovating old buildings that others thought fit only for demolition. Afflecks Palace, Ducie House, Smithfield Buildings, have all been restored and given a new lease of life by Urban Splash. There's a great stock of interesting buildings, and interesting venues for bars and restaurants and living spaces..., the friendliness of the people and the pride of the community in our city. Is there anything about Manchester that could be improved? I'd like to see more conversions of the derelict buildings, and I'd like to see a world class building coming to Manchester, like the Sydney Opera House. Which places in Manchester do you like to go to? Mash & Air, Heathcotes, little curry houses in the N Quarter, Castlefield, Atlas. Greetings from very hot Arizona 114 % today. Still enjoying your website. I am really excited as I am going to a British Rock Symphony Celebrity Theater here in Phoenix Arizona. Also next Saturday there will be Peter Noone of Herman's Hermits, Davy Jones of the Monkeys, two Manchester boys, so it will be like old home week. Keep up the good work. I remember watching both of those on TV when I was a kid. We'll be having lots of pop stars in Manchester at the upcoming In The City festival, in September. We're working on a feature website at the moment! All the best, and enjoy the concert! Hello again Aidan. Since I started my request to hear from old friends and others that lived in Collyhurst back in the 50's, 60's and 70's, I have been flooded with responses. One very nice couple from the Church of the Saviour (on the site of the old St. Oswalds on Rochdale/Eggington St.) wrote to me about a Collyhurst Reminiscence Day. The sent me an album showing poster boards of old photos from the Collyhurst area! It was absolutely wonderful. I have written and asked them if there was any way they could send me some of the photos (copies of course!) Just thought I'd let you know what kind of "goodies" are floating around out there that some of your readers (and viewers!) may like to see. I look at Manchester Online almost every day now and it is great. I probably know more about what is going on than some of my family who still live there! Keep up the good work Aidan. All my pals here can now see what my lovely Manchester looks like! Try and work getting some of that old stuff for your collection! Great to hear from you. I'm hoping to get some of those old photos online soon, but copyright issues have to be sorted out. Thanks for your message, and please keep visiting Manchester Online and Eyewitness in Manchester!